Barnby Dun CC 1st XI: Back row (l-r): Paul Dykes, Umar Ali, Jay Horne, Scott Dixon, Zully Shah. Front row (l-r): Idris Khan, Michael Fell, James Copley (capt), Ben Salter, John Gray, Sully Ahmad. Barnby Dun missed an opportunity to move further clear of the Division Two drop zone as they went down by 30 runs at home to Whitley Bridge. James Copley claimed a hat trick and finished with 4-10 to help restrict the visitors to 119 all out. 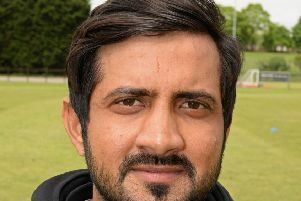 But the Glass Park club struggled with the bat and only tailender Umar Ali (39) made any meaningful contribution as they were dismissed for 89 in 29.1 overs. 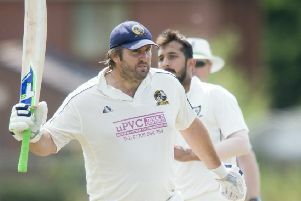 In Division One Brodsworth Main won a closely fought contest at Frickley Colliery by 18 runs. David Merryweather (51), Alex Snaith (49) and Ross Weston (39) helped Main post 211 all out. Jason Mills took 6-71 for Frickley. Openers Mohammed Ayub (57) and Inderjit Singh Hayre (51) laid a strong foundation for the hosts but they collapsed from 137-1 to 193 all out. Craig Richardson (3-14) and Merryweather (3-63) shone with the ball for Brodsworth. Askern Welfare lost by 31 runs at home to Old Sharlston. Welfare’s Jeff Morton claimed 2-45 and then made 85 with the bat but his side could only reach 176 all out in pursuit of 208 for victory. Hooton Pagnell were comprehensively beaten at home to Fairburn. Only Alwyn Dyke (15) reached double figures as the hosts were bundled out for just 80. Danny Murray smashed an unbeaten 64 from 58 balls to guide Fairburn to a comfortable seven wicket win in 15.4 overs. Bottom club Hatfield Town, who are still without a league win this season, suffered a 181-run defeat at South Kirkby.